In discussions of Paul's letters, much attention has been devoted to statements that closely identify Christ with Israel's God (i.e., 1 Cor 8:6). However, in Rom 3:30 and Gal 3:20, Paul uses the phrase "God is one" to link Israel's monotheistic confession and the inclusion of the Gentiles in the people of God. Therefore, this study traces the OT and early Jewish backgrounds of the phrase "God is one" and their possible links to Gentile inclusion. Following this, Christopher Bruno examines the two key Pauline texts that link the confession of God as one with the inclusion of the Gentiles. 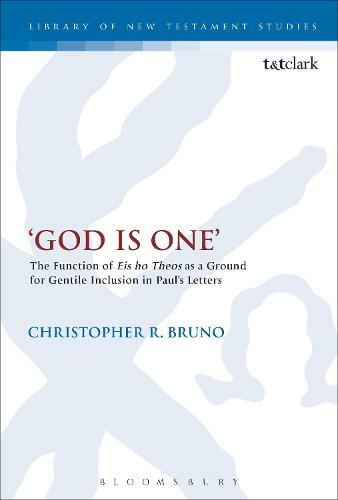 Bruno observes a significant discontinuity between the consistent OT and Jewish interpretations of the phrase and Paul's use of "God is one" in relation to the Gentiles. In the both the OT and earlyJewish literature, the phrase functions as a boundary marker of sorts, distinguishing the covenant people and the Gentiles. The key exception to this pattern is Zech 14:9, which anticipates the confession of God as one expanding to the nations. Similarly, in Romans and Galatians, the phrase is not aboundary marker, but rather grounds the unity of Jew and Gentile. The contextand arguments in Rom 3:30 and Gal 3:20 lead to the conclusion that Paul's monotheism must now be understood in light of the Christ event; moreover, Zech14:9 may play a significant role in the link between Paul's eschatological monotheism and his argument for the inclusion of the Gentiles in Romans and Galatians.